This does not appear to be a WXR file, missing/invalid WXR version number. There are several possible reasons for this error, but in most cases it’s missing php function on your server configuration. 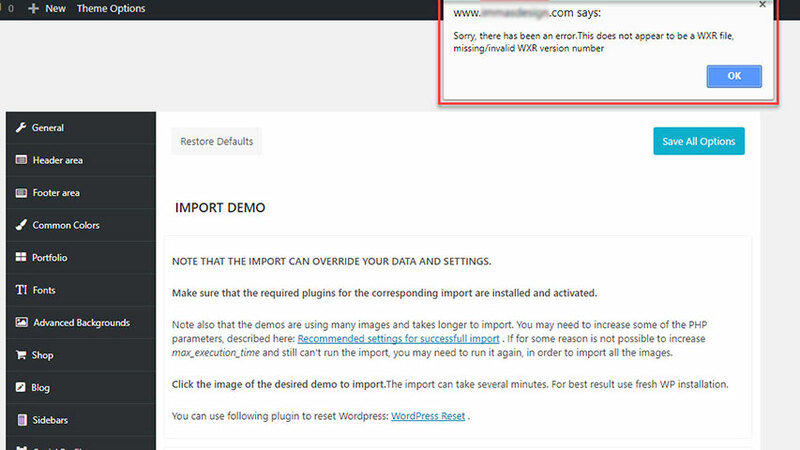 Whenever you get this error, first thing to do would be contacting your hosting support and ask if the SimpleXML PHP module is active for your server. There are other possible reasons for that error, but these are really rare cases. The first would require to manualy check your XML file and, near the top part, add the line “<wp:wxr_version>1.1</wp:wxr_version>” (without quotes) right after the language declaration part. You can find more information in the WordPress Support Forums. Another rare possibility is that PHP safe_mode might be turned on for your hosting server. The safe_mode options being “ON” does not necessarily mean that it is the cause of the issue, but it’s worth checking this too. Like in the first (and most probable) case, you will need to contact your hosting support and ask if safe_mode is turned on. If you know for other possible reasons and solutions, we’d be happy to discuss in comments. OK, I run my own apache server, can not get help from a host. I surfed the internet and found many different solutions on how to alter my php.ini file. None of them works. Since I have very little time to set up and go live with this theme I must ask if there is another way to activate your demo in to my script. I Really do not have time to experiment with this issue. Would be a shame if I have to buy another theme for such a small issue, but I REALLY need to get started. It is that important for me. In this case you should just enable the SimpleXML PHP module on your server. No need to experiment. However, there is no other way to import the demo. Your server must meet the official WordPress requirements and SimpleXML is one of them. First thing to know: This is not a problem with the theme or a bug! Second: Don’t panic! 🙂 There is an easy solution in 99% of the cases.